Individual Written House Number - - spelled out in letters. 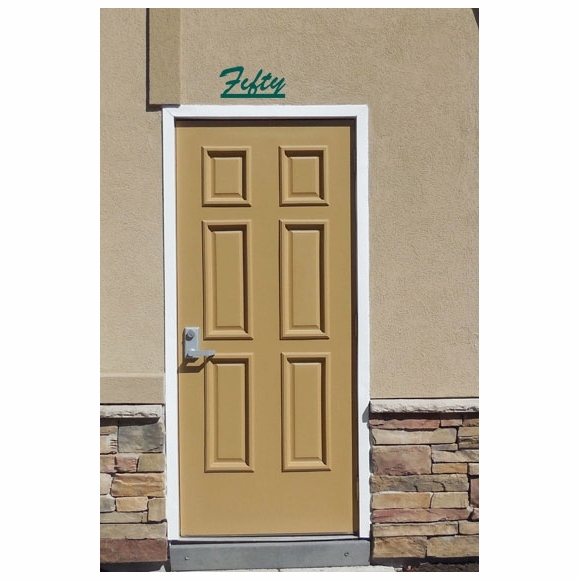 All letters in the word are attached to a single slim base for easy installation. Comfort House exclusive custom made for you. Made in USA. Number words available include zero, one, two, three, four, five, six, seven, eight, nine, ten, eleven, twelve, thirteen, fourteen, fifteen, sixteen, seventeen, eighteen, nineteen, twenty, thirty, forty, fifty, sixty, seventy, eighty, ninety, hundred, and thousand. This is a one-piece, one-line sign. Number words are sold in either a block print (style A) or cursive script font (style B) and are a step above the standard numbers usually seen on a home. Cut-out, silhouette letters seem to float in the air. The characters are attached to a narrow border (approximately 1/2" high) at the bottom. Standard size signs hold up to nine (9) approximately 3-1/2" high letters. The actual size will depend upon the "tails" on the letters. Sign length varies from approximately 11" for a four (4) letter word to 23-1/2" for a nine (9) letter word. In addition, we also offer a sign with a two-word number that holds up to 10 characters including the space (style C). NOTE: If your order is for style A or style B, please leave the Number Word 2 input box empty. Total height including base is approximately 4" x 0.125" thickness. Manufactured of 1/8" modified acrylic plastic. Suitable for indoor and outdoor applications. Available in all 11 colors shown in the color chart: burgundy, ivory, white, grey, charcoal, red, yellow, green, blue, brown, and black. Comes complete with mounting holes and stainless mounting screws. ** Our written house number plaques can also be manufactured in a size up to 36" wide and/or with a larger character size. Please contact Customer Service with your specifications for a quotation.